We’ve never reviewed both a book and a DVD series…until now. The same rock solid material that we’re accustomed to with Pastor Danny Silk is evident in this book and DVD series, which complement each other. The material is more or less a compilation of solutions to the questions, challenges, and obstacles presented by adopters of Silk’s teamwork resources over the years. Developing a ministry or business dedicated to the realities of Heaven isn’t without challenge, and this series attempts to field the top questions posed to Danny in a practical yet impressionable way. Danny invites several ‘powerful’ people into the fold in this useful study series, and real life examples from culturally adept leaders prove to be an effective way to reinforce the honor-fostering culture, whether it be in ministry or business (both are interviewed as part of the DVD/CD set). The content is completely original and very much indicative of what Bethel Church has been able to sustain and cultivate, so its value for individuals and teams is immeasurable. Its organization and presentation, however, could be better. As a whole though and with formalities aside, the wisdom and boundless principles packed into this resource set lead me to recommend this to any team, advising board, council or individual, without reservation. In the very first section of the study guide, Pastor Silk answers this question, something I was yearning for not just for myself, but readers everywhere, especially those not as privy to charismatic circles. In contrast to the dusty, chivalrous definition of ‘honor,’ Silk hones in on its real meaning for the body of Christ: within the parameters of earthly relationships, honor is the pursuit of freedom with one another and the opportunity, through conversation, to express the ways of Heaven and replicate His model for love. [my paraphrase] This distinction is important in kicking off the study guide and helps to clarify honor, as it’s intended biblically, and therefore necessary for development as leaders and, more generally, people who show honor to one another. Each chapter, or session, is comprised of several sub-sections which are designed to provoke discussion and reference points made from the correlating DVD theme. It’s nicely put together in that at the conclusion of each section, students are actually challenged to “DO” something physically with the material learned. As business & life coaches who operate in ‘practical application,’ this is a great idea and one that makes the material most worthwhile. For each session or chapter there exists several Foundation Stones, or driving principles, that are more or less products of an honor-injected culture. For instance, Session #1 establishes freedom, valuing relationships, and destiny as core essentials in sustaining honor – these stones are the foundation with which honor can be built upon. Silk uses real life stories to help practically communicate the foundation stones in effect, or without effect. This is a good tool for people who prefer an illustration to fully grasp the ‘meat and potatoes’ of the concept. Cultural Effects point to the fruit yielded in an environment that’s fundamentally sound; in other words, a cultural effect, as Silk defines it, is the result of a solid foundation in and around a relational environment. These tend to be fulfilled promises like freedom, identity, abundance, etc. The Solid Foundation exercise at the end of each segment calls on students to Study, Pray & Do. The “Do” portion is like a homework assignment or a list of action items to put into practice what was absorbed in the session. The “Study” assignment many times references outside resources as extracurricular material. If the DVD complement were being presented to a group, I think sub-titles or captions of the core principles would be a good idea. Thinking specifically of presentations to teams ready to take notes or record findings, this would be helpful, especially if the group isn’t formally working through the book at the same time. The Foundations of Honor kit comes with a book, three DVDs and three CDs. The CDs mirror the content from the DVD’s but are solely audio. Six discs packed into a case was a touch cumbersome. Having the ability, however, to watch footage or listen to audio is great, but to consolidate things it would have been interesting to see all of the media come in a thumb drive, or similar piece of hardware. Not all of the ‘Foundation Stories’ were universally clear. Narratives are a great way to further the point or principle, but they should be broad enough to be understood by folks removed from Pastor Silk’s world. Students are tasked with Solid Foundation homework, but no mention is made of checking in or being held accountable to actually get the assignment(s) done. Granted, a group or class could facilitate this, but a note or exercise built in to the study guide would be a bonus. Team-wide “inevitables” like confrontation are approached in “Foundations of Honor” like no other resource I’ve seen or heard of, although I’m admittedly green in this area. Silk’s template for these relational precursors are otherworldly, which should be a good sign for Christians, knowing that we’re destined not to be worldly, but heavenly in the way we communicate, interact and display honor. 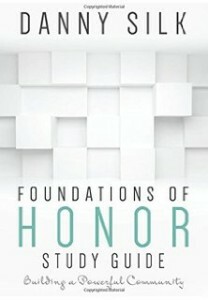 In this way, Foundations of Honor is one-of-a-kind, and it comes from culture-bearers who have walked the walk. This study series is probably ideal first for churches, but if the principles within were but even partially applied in other spheres like business or media, we’d be primed for relational revival. A singular favorite of mine within this series was the bonus DVD footage of Silk facilitating a three-way conversation (with Bill Johnson & Kris Vallotton) about honor, love, and crafting an atmosphere that invites the presence of the Lord. It wasn’t just a delight because these are three of my heroes and the topic is a passionate one for me, but because the wisdom and experience in the room simply commands listening ears. A trio so vital to the American church as these three left me watching this segment over and over, devising ways to apply what was being taught. Danny Silk’s “Foundations of Honor” is uncommon yet timeless, and even though there could be some technical cleanup with how it’s presented and organized, it’s the model for how teamwork and relationships should work. If your goal, whether you run a business or pastor a church, is to emanate Heaven in how you treat those around you, buy this resource and work through it with your team – there is nothing else quite like it, and your organization or church will reap the rewards. Don’t forget to enter to win your complete set simply by following the link below and submitting the email form. Posted in Book Reviews and tagged community, culture, danny silk, destiny, DVD, foundation, honor, relationships on March 1, 2016 by joesharp. I am looking to take a group of women through this. Would you say that we should do the culture of honor beforehand? Or this as a first one is good? It is not just a leadership team. It is our women’s bible study. But I know we need this in our church and, I am thinking, if we can grow relationally with one another it will affect homes, workplaces, and so on. Thank you for your feedback on this?